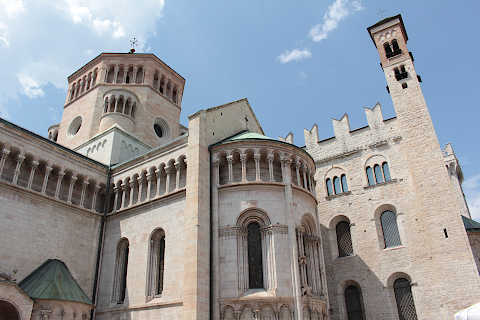 The cathedral in Trento is situated in the main square, the Piazza del Duomo, in the historic centre of this impressive town which is the capital of the Trentino region of Italy. 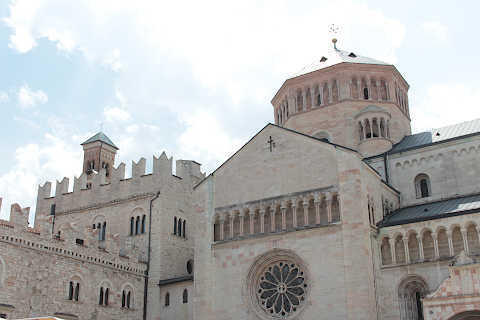 It was in the 13th century that Federic Wanga, bishop of Trento, ordered that a new cathedral should be built. 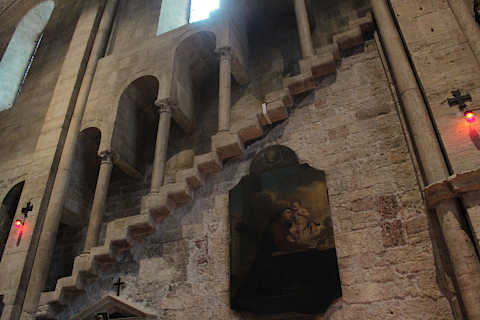 At the time building began the romanesque style was popular but by the time it was nearing completion the gothic style had become popular: hence we see both of these styles in the cathedral. Among the most noteworthy elements on the outside are the rose window that dominats the facade, the absence of the second tower (only the tower on the left of the facade was built) and the lions supporing the columns on the north side. The facade is less intricate than many from this period. 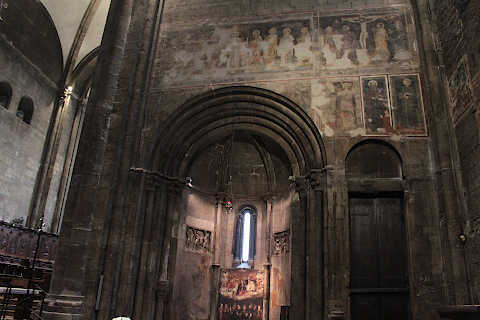 Inside Trento cathedral there are 14th century frescoes, the relic of the three martyrs that inspired the building of the first church in this location, and several other interesting religious artefacts. 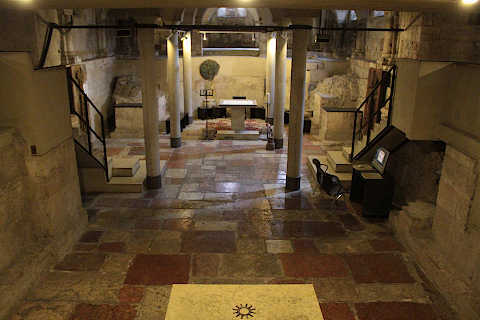 A church has stood in this location since the 4th century, and inside Trento cathedral you can enter this very primitive basilica - access is down some stairs in the north transept, and an admission of 1.50 euros is payable. The building is more extensive than you might expect, 43 metres long and 14 meters wide. 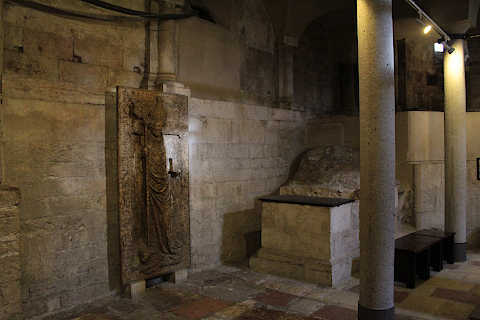 The original basilica was built using stone from nearby houses to provide a place for the burial of some missionaries who had been murdered in the nearby countryside in 397 AD as well as a burial place for one of the first bishops in Trento, called Vigilius. 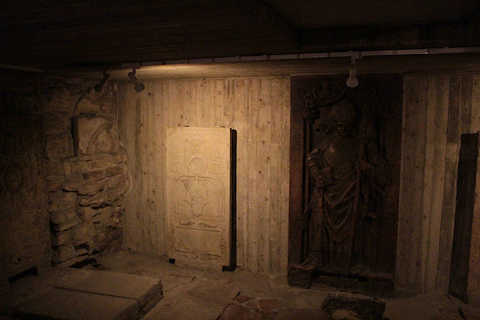 Hence, originally the building was a shrine. 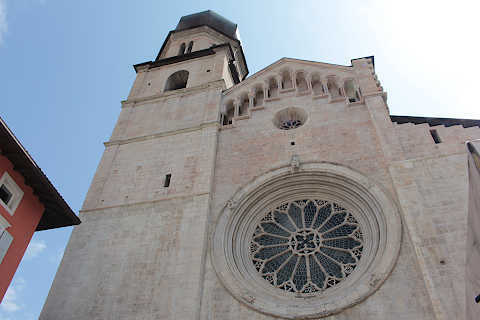 It became a cathedral church in the 9th century when the bishops palace you can see next to the cathedral was first built in Trento. 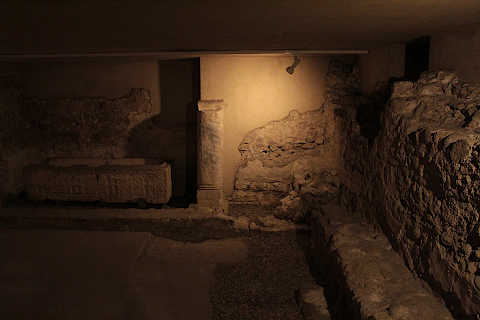 The floor of the early church is covered with many tombs, with the tomb of Vigilius at the end. 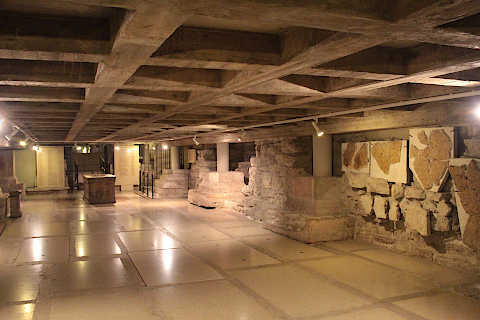 Apart from the tombs there is not a great deal to see in this ancient basilica, apart from some carvings and an area of mosaic, but it is interesting to visit such an ancient place of Christian worship. 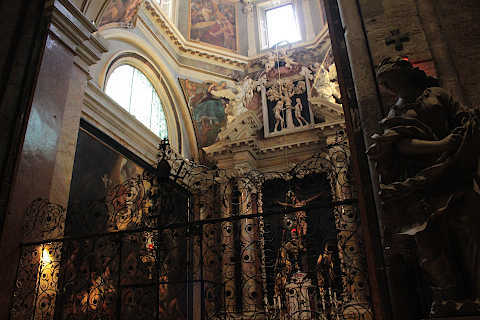 Also in Piazza Duomo you can visit the Diocesan Museum of Trento. 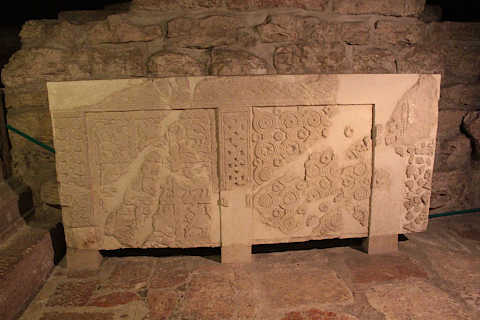 This collection of artefacts from the town and region is situated in the Bishops Palace, the Palazzo Pretorio, next to the cathedral, admission price 5 euros. 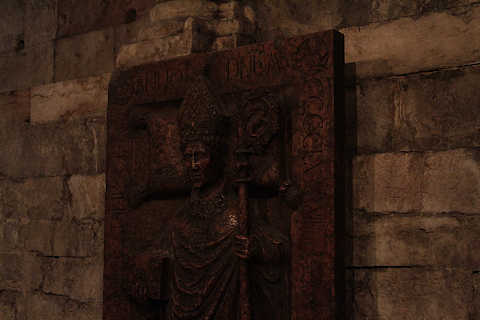 The collections are very varied and include numerous artworks, crafts, sculptures and tapestries covering the period from the 13th century to the 20th century, as well as the cathedral treasury and medieval illuminated manuscripts: together they create a very impressive collection of artefacts. 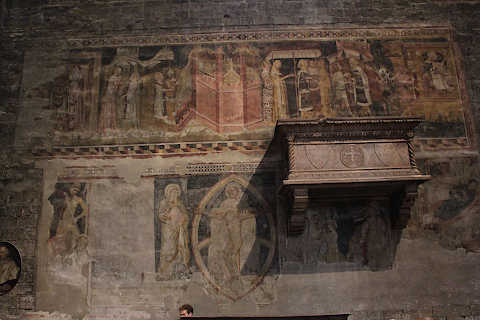 There are numerous imposing monuments including churches, medieval towers and renaissance palaces to discover in the heart of Trento. One of the most important monuments is the Castello de Buonconsiglio to the east of the city centre.